I am a seafood and meat person but I also love my veggies and fruits and I’ll never get zapped on the head for not eating them (as in the ad), but I’ll have to tell you that today Chris sold me on the art of preparing and serving them raw and yes, I loved it all. Although Chris is native to Saskatoon he claims to be a nomad. His passion for an holistic and hygienic life-style approach to foods has directed him to educating people about food, health, and athleticism. Chris is a vegan and is serious about nutrition, except when he’s cooking for a crowd, he “likes to bring in fun and silliness into food”, and he really likes to talk about his passion and knowledge. A skateboarder at heart Chris made a life-changing decision to become a vegetarian as he believed this would improve his athletic ability. During his enrollment in RHN he met Dr. Douglas Graham who introduced him to the healthy benefits of eating fruits and vegetables raw. It is now close to 8 years and Chris has lived a healthy vegan life-style since following Dr Graham’s diet. Chris believes in the art of ‘food combining’: “cooking foods in a sequential order for optimal digestion”. Hence the following sequence of his Agrium Kitchen presentation. 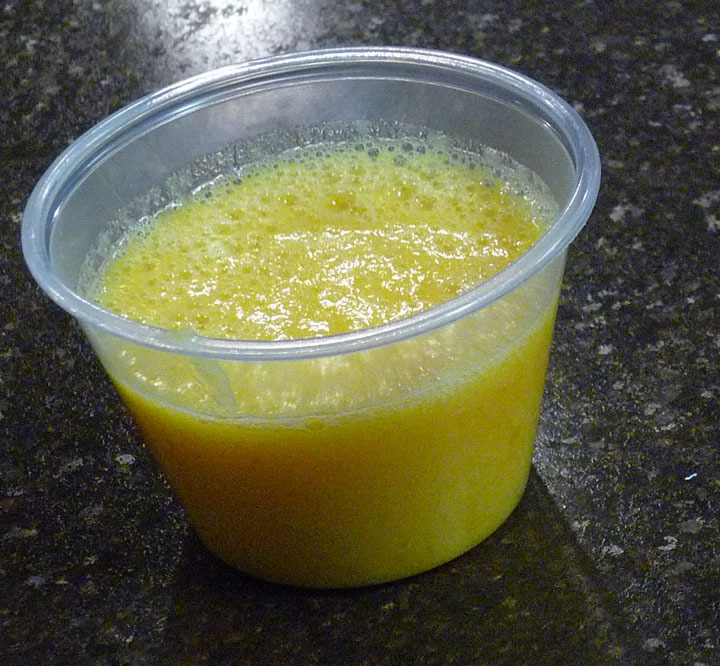 A fresh concoction of seedless mandarin oranges and pineapple this drink serves as a refreshing starter and a great energy boaster. 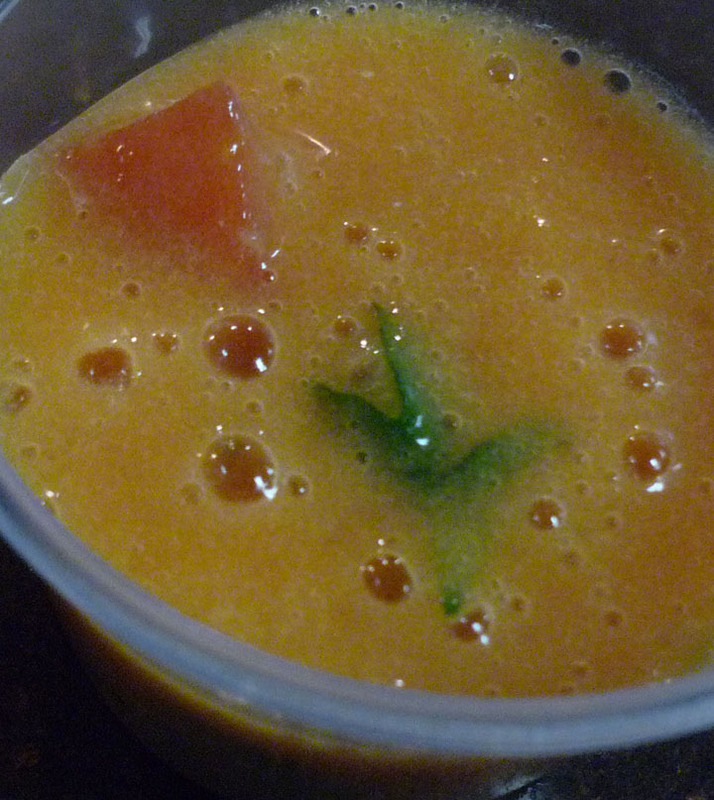 The addition of mango reduces the acidity of the tomatoes and gives the cold soup a rich refreshing flavour. I loved this dual and the addition of fresh cilantro. I would have to say, this dish, truly amazing! In fact, after finishing I sauntered around the market and heard nothing but great comments. 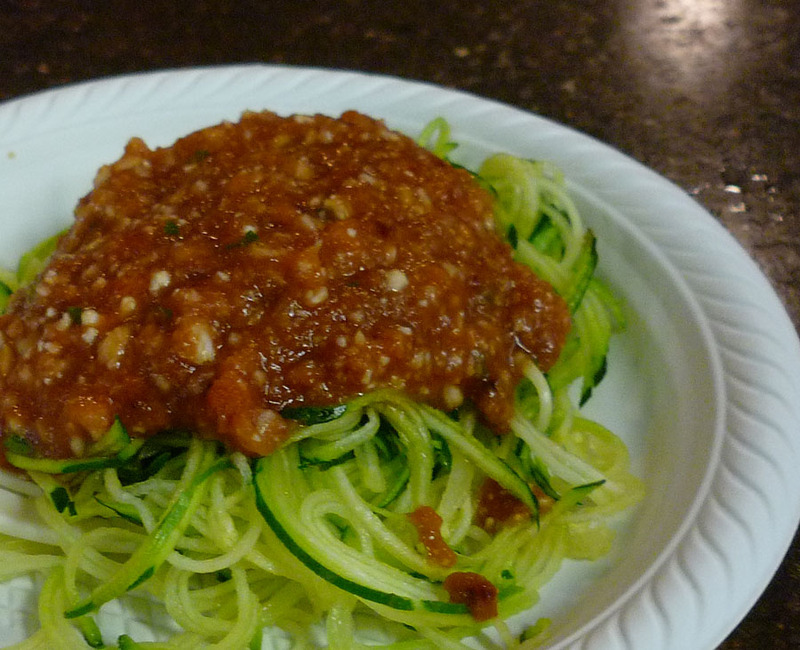 The pasta is zucchini made from a vegetable pasta machine and served raw. The sauce is made from tomatoes, red bell pepper, sun dried tomatoes, dates, fresh basil, and cauliflower. After watching how easy this Joyce Chen Spiral Slicer made veggie pasta I think I need one. Chris has published 101 fricken’ rawsome recipes and is in the process of publishing a gourmet vegan recipe addition. If you are a vegetarian or vegan, if you like to make awesome creations with raw vegetables, or if you just want to enjoy the health benefits of fruits and vegetables in flavorful dishes then check out this nutritional guru’s website and his awesome recipes. You will enjoy. Stay stewed for more market stewings in January.